This weekend marked a very special milestone on the Dragonfish Path, one worthy of awakening the sleeping Dragonfish Blog. I achieved an major goal for the year by recording an oral history interview with my grandmother before our family Christmas gathering. Part of understanding where I come from is understanding who I come from – and I know my mom’s mom (known as “Ba” in Vietnamese) is full of stories that I’ve never heard. A few months ago, I sent my grandmother a list of nearly 50 questions, everything from what toys and foods she liked as a child, to how the conflicts in Vietnam affected her life. In a more perfect universe, I would have been able to understand and speak Vietnamese well enough to conduct the interview myself. But in this case, the importance of getting the story surmounted my language hangups and I enlisted the help of my mom as an interviewer. Rather than interrupting their flow to get things translated, I just sat back to bask in the interaction of these two important women in my life, content that I could pick out enough words to know which question they were on, and requesting more elaboration at some points. The quality of the video is far from professional as I futzed over the background and lighting. Most important was trying to make sure Ba was comfortable, and it seemed most fitting to shoot the video at her kitchen table. And at the end of the day, the main thing is that we captured her story (or at least the parts that she was able to tell in our hour-and-a-half recording session). When I first sent her the questions, Ba had told my mom and aunt she wasn’t sure who would want to listen to her stories. But I think we convinced her how much this would mean to her children and grandchildren, and at the end of the interview, she said she was happy to be able to share something with us in this way. I hope to work with my mom on the translation and try to stitch it together with video I collected on our family trip to Vietnam with Ba earlier this year. With any luck, I may have something to show for it by the time Ba turns 90 next September…At any rate, the dream of the Dragonfish Path is still alive, and I hope to keep moving forward on it step by step. One last note on that illustrates the intricacies of the Vietnamese language. There are no simple words for “I” or “you.” Everything is contextual (which means just starting a conversation with someone is rife with pitfalls for the beginning language learner). Before we started the interview, my grandma asked how she should refer to herself. We decided that the more formal “toi” was too impersonal, and so she referred to herself as the more familiar “me” or “mom,” since she was talking to her daughter, my mom. Today I put on my scientist hat for a decidedly unglamorous task. I spent a number of hours poring over data sheets and referencing them with a database, making changes on the computer where our intern had noted discrepancies between the written and the typed data. There is nothing like tedium to drive you to reflection. I admit, I can appreciate my share of mindless, repetitive tasks. You can’t beat ‘em for that satisfying feeling of productivity. What else could have powered me through dissecting 1,000+ fish stomachs for my master’s thesis? Even data checking itself is a somewhat comforting and familiar zone, in which I also spent many an hour of grad school. But sometimes, now as then, this kind of work makes it hard for me to keep my eye on the end goal. What’s the point?, I wonder. What’s the value in how I spent my day? How is this work meaningful? These data I’m wading through are from the village fishing survey project that I helped organize last fall – which has been one of the most challenging and rewarding projects I’ve worked on at FISHBIO so far (and which I have yet to write about…). And if I still want to call myself a scientist, I can’t just drop in for all of the “fun” parts of doing research. It can’t all be just hanging out with the fishers, holding workshops, going out on boats, taking pictures of pretty fish, and drinking Beer Lao – as much as I’d like it to be. (I once told someone that my dream of being a science writer was to tag along for all of the hands-on field science, then play with fun ways to communicate it while the scientists wrestled with analyzing the data. “That’s cheating!” he said. Is it?) But I don’t want to just pay lip service to this science, I want to be able to say I really understand it – and mean it. So I have to be willing to dive into the frustrating minutiae of the nitty gritty. It’s part of piecing together a bigger picture that will only be as accurate as every pixel that makes it up – every fish length, every net size, every fishing time. 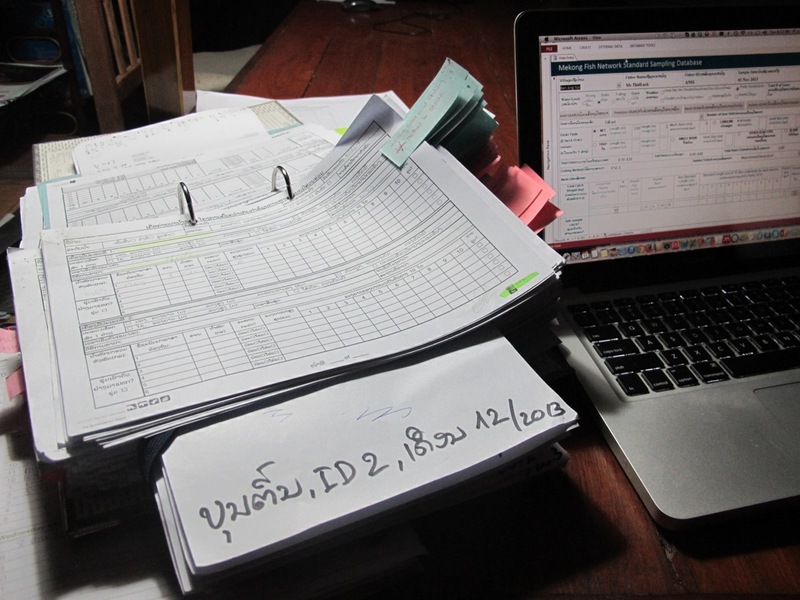 So now that means trying to make sense of all of the information we asked ten fishermen to collect for three months – and at the most basic starting point, it means making sure we’ve cataloged all of that data as accurately as possible. I’m learning small things along the way: how to decipher Lao handwriting, how to translate the difference between “didn’t catch fish” and “didn’t go fishing,” understanding how fishermen measure the height of their nets in the number of mesh holes, not in meters. It’s easy to get impatient – how is this leading me toward my goal, down my dragon fish path? I find myself wanting the pay-off now – I want to be an expert, a credible source of information, I want to be making a real difference in conservation and help people understand and care about this complex and fascinating setting that I’m just learning to understand myself. Staring down a few massive binders of datasheets sure forces you to take the long view. I’m trying to learn as much as I can in a new environment, which takes time. I’m building my confidence, which comes with experience, which takes time. I’m still on the path. But I have to pay my dues, and I have to earn it. 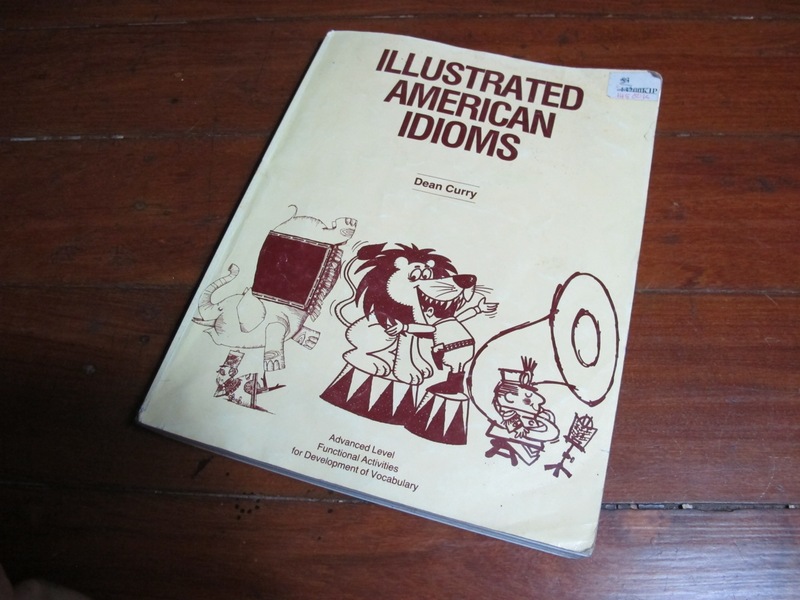 Today my Lao coworker was leafing through his dog-eared copy of “Illustrated American Idioms” from 1982 – a gem I found buried in the closet yesterday while trying to make an inventory of our books. It’s quite the slice of American culture – illustrated in the style of ClipArt. Someone has turned it into a coloring book, probably before Sinsamout came to own it. He flipped to the phrase “big fish in a small pond” and asked me what it meant. I said it’s like feeling important in your small village, then coming to the big city, being surrounded by lots of accomplished people, and realizing you don’t really know very much. 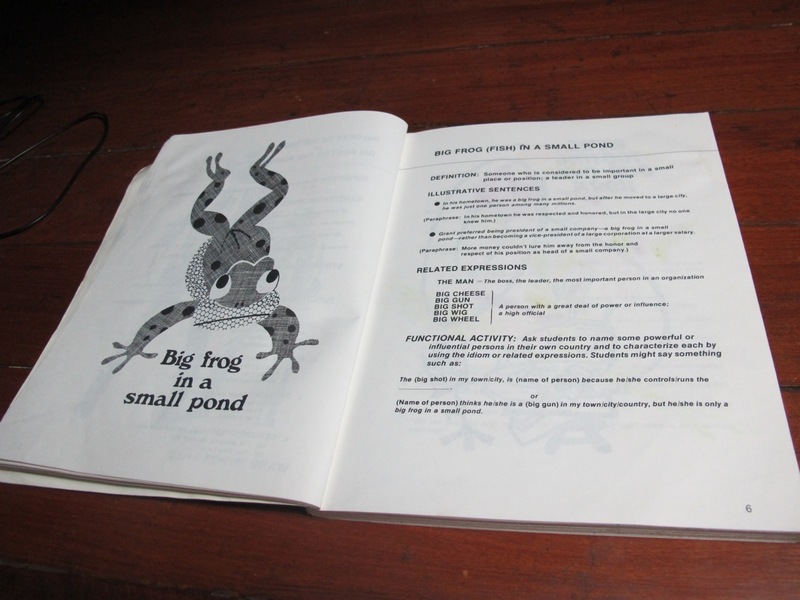 Naturally, this also introduced the concept of a “small fish in a big pond.” Actually, the book listed the phrase as “big frog in a small pond,” which I had never heard of – so we both learned something. Well, you can disregard the report in my previous post of this season’s cooler temperatures. After I experienced one day of refreshingly chilly weather, the heat has flipped back on and stayed there. People are remarking that it’s turned warmer earlier than usual this year. “You’ll learn to love an air conditioner,” one friend said. One of the traditions of Lao New Year that I’m looking forward to experiencing next month is people relieving the oppressive heat of April by throwing water on each other. I’ve heard more than one proposition that maybe this practice ought to start a month early this year. 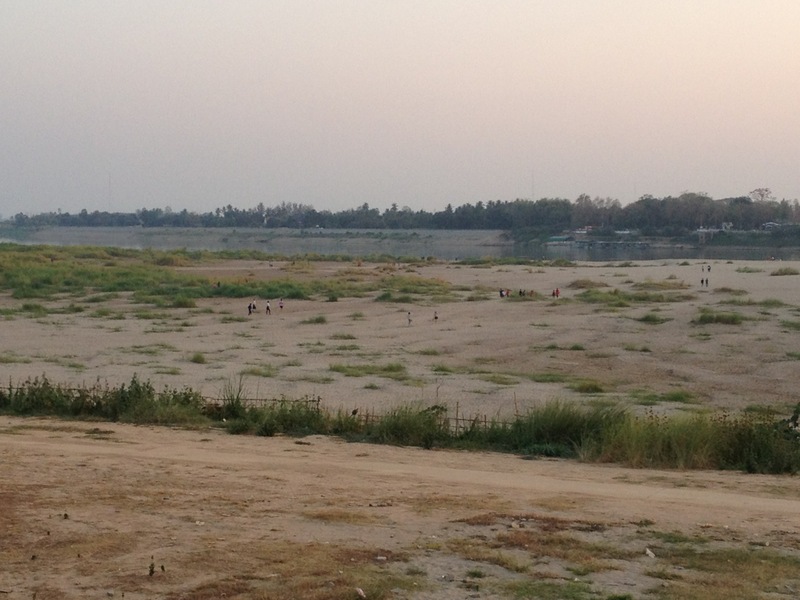 I am still fascinated by the low water level of the Mekong River in the dry season. 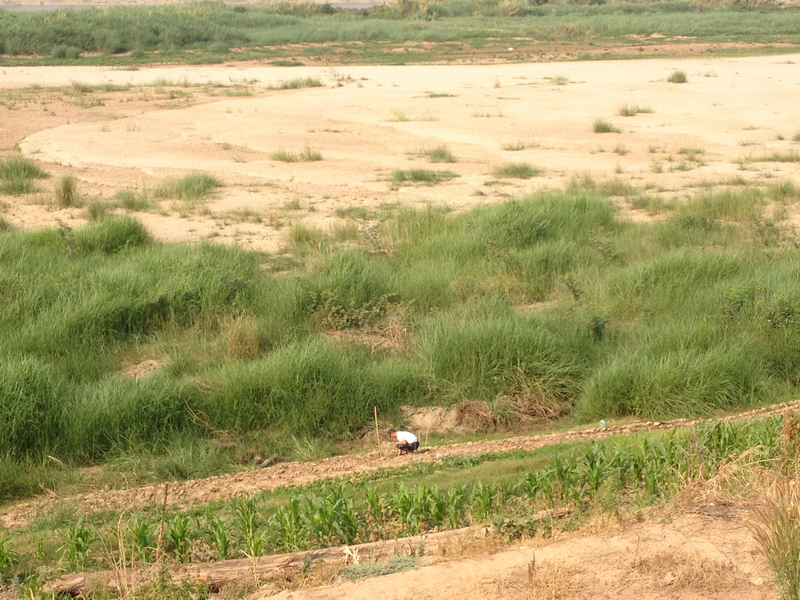 One product of this recession is I’ve noticed people tending gardens on the exposed land along the river. These riverside gardens are an important seasonal component of Lao culture that cycles with the river. When the water level is high during the rainy season, fishing is in full swing. 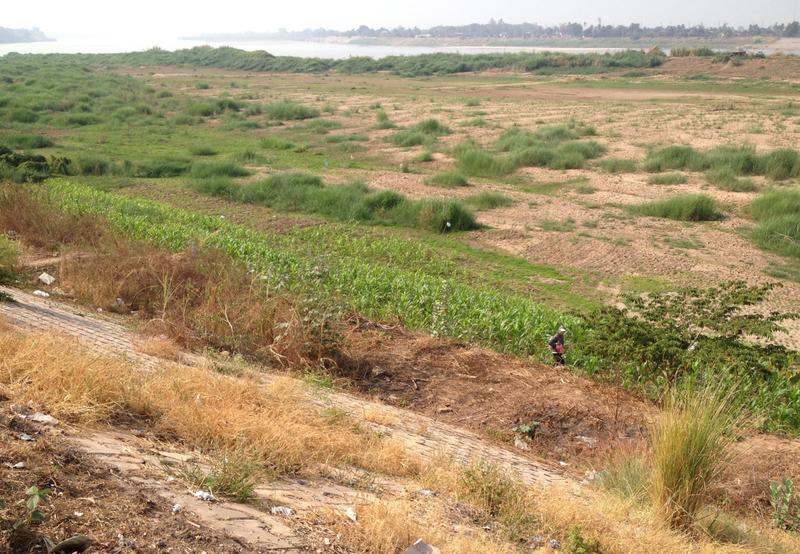 When the river drops, people plant gardens on the fertile riverbank soil. My FISHBIO colleagues have taken photos of riverside gardens in Lao villages – it was interesting to see some for myself right in the city of Vientiane. Farming is a very important part of life in Laos, and farming and fishing often go hand in hand. It seems like a lot of people are part farmer, part fisher, depending on the season. Rice is the primary crop in Laos, and other important crops include corn, sugar cane, sweet potatoes, soybeans, and various fruits and vegetables. Coffee is also grown in the southern part of the country. 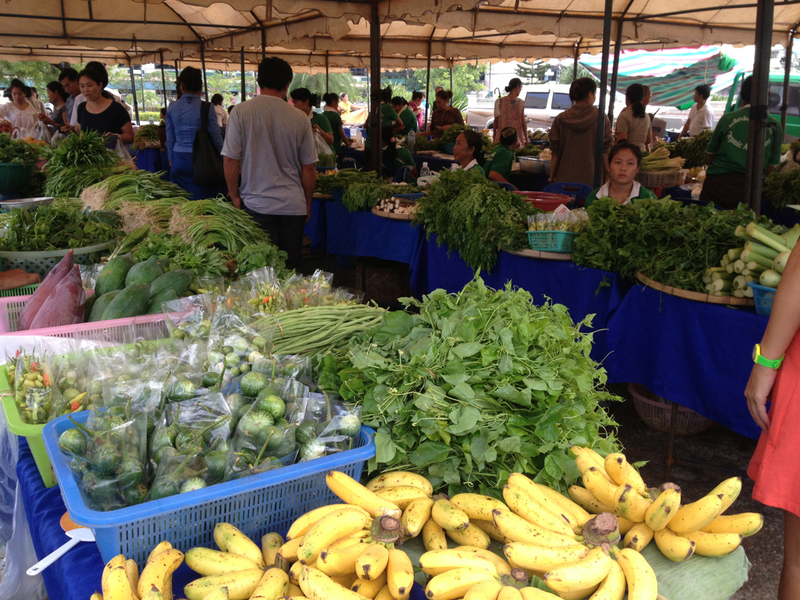 At the organic farmer’s market (where I think it’s more likely to find crops grown locally rather than imported) I’ve seen bananas and many vegetables and herbs, including cucumbers, pumpkins, okra, and leafy greens. 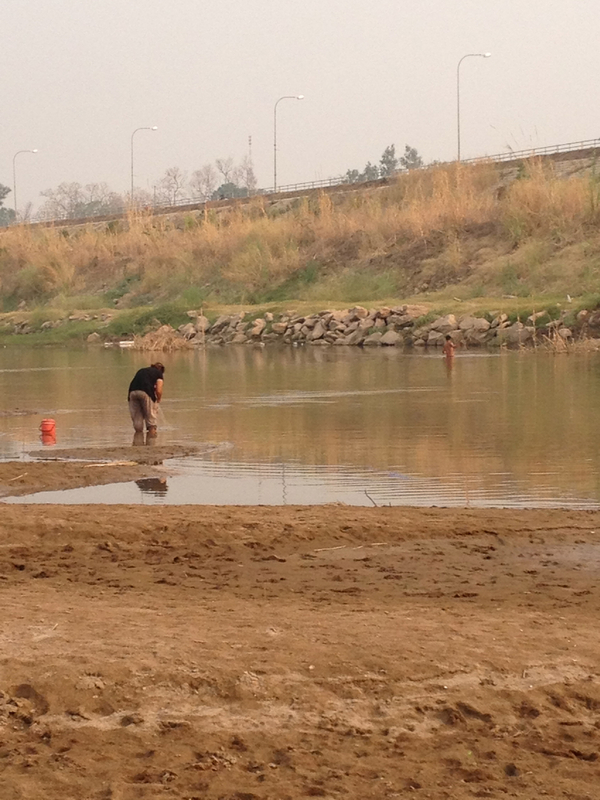 Despite the lack of water, people are still fishing in the cut-off side channels, searching for whatever hapless fish are trapped in what essentially amount to large puddles. I can only guess as to their success. The Mekong is known for its highly variable water flow between the rainy and dry seasons, so I shouldn’t be so surprised by its contraction. But seeing so much dry land is a sight I haven’t quite gotten used to. Coupled with the heat and the low water is the dust. If it seems dusty here in the capital, I can only imagine how it must be in the villages, with a lack of paved roads and an abundance of red dirt. Lots of plants and trees here look like they’ve received a dusting of cinnamon. When I asked a friend about the haziness of the sky, she thought it was a result of the dust ­– I suppose that’s a bit more comforting than my smog hypothesis, though my guess is the true cause is probably a mix of both. Leaving a drought-afflicted state to land in another country’s dry season heightens my constant thirst has me craving rain. I’m thankful to hear California is finally receiving some much-needed rain and snow back home. I’m increasingly reminded how precious water is – especially when you have to drink it from a bottle. But more on that later. 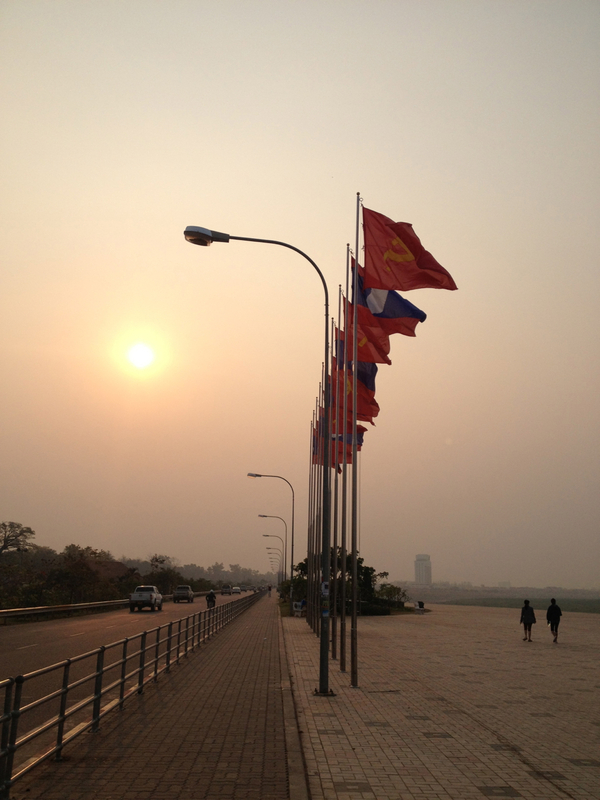 After nearly four months in Laos, then less than three months at home in California, I’ve just arrived back in Vientiane – and am navigating an interesting sensation where my surroundings are both familiar and unfamiliar at the same time. This trip isn’t filled with the same novelty of my last one, when everything around me was new. But after hopscotching on to Laos after a vacation in the Philippines, coming back feels decidedly surreal, like it hasn’t quite sunk in yet that I’m here. Much is like I remember, some is not. 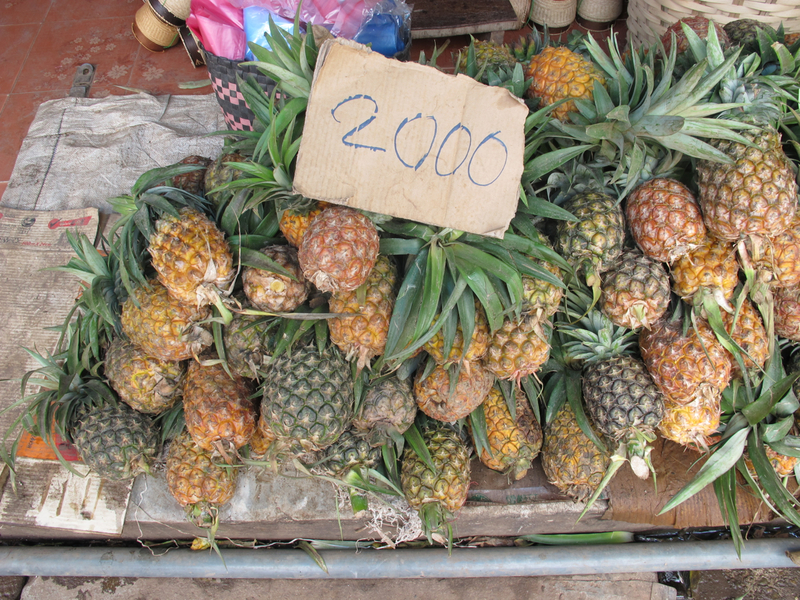 Part of the change is that I’m experiencing Laos in a new season. My previous trips have been in late summer and fall, and now it’s winter. It’s odd to feel like I could use another layer of clothing or a blanket on the bed – although the temperature flipflops from hot to cold from day to day. I’ve missed the legitimately cold weather of January, and I’ve heard people refer to February as spring, since April brings the scorching feeling of summer. I’ll get to feel it for myself, since I’m planning to stay until mid April to experience Lao New Year. There’s a haziness in the air, and the color looks bleached out of the sky along the horizon – could be that the lack of rain means there’s nothing to wash the city smog away. 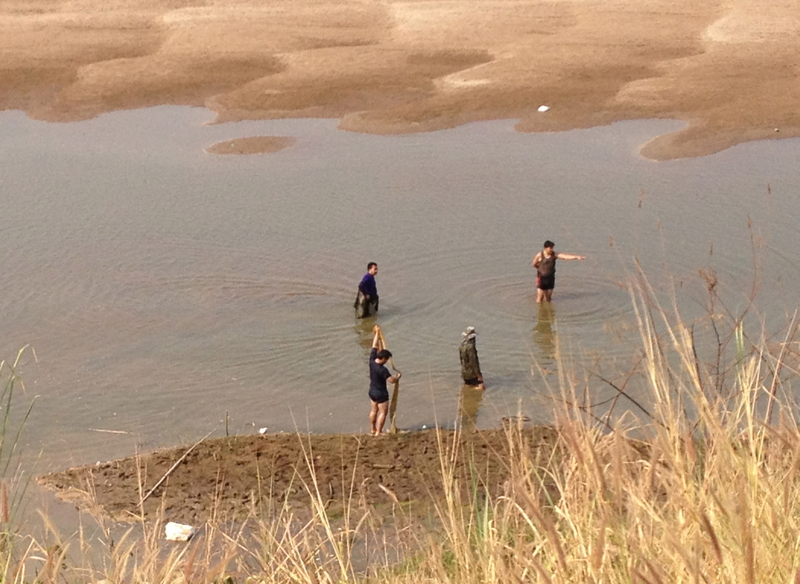 In perhaps the biggest change, I was stunned to see the water level of the Mekong River so low. People were walking and playing soccer on wide expanses of sand that I remember being covered with water, and fishing platforms stand high and dry among clumps of exposed vegetation. I felt like it would be nearly possible to walk across to Thailand. It is the dry season, after all ­– although my coworker thinks that the river is lower now than it used to be, due to dams and water diversions upstream. There are other changes, too: work at the construction site next door to my office grinds on, relentlessly grating and rumbling, as a massive concrete structure rises. Neighborhood puppies have grown into shaggy dogs, some trees have lost their leaves, while others bloom with bright orange flowers I’ve never seen before. But other things are familiar and the same – the restaurants, the night market, the aerobics class by the river. It’s comforting that I’ve built up a handful of go-to places and favorite spots. I hope these will help me get back into my routine, while I’ll open myself up to new experiences and learning in this latest season. 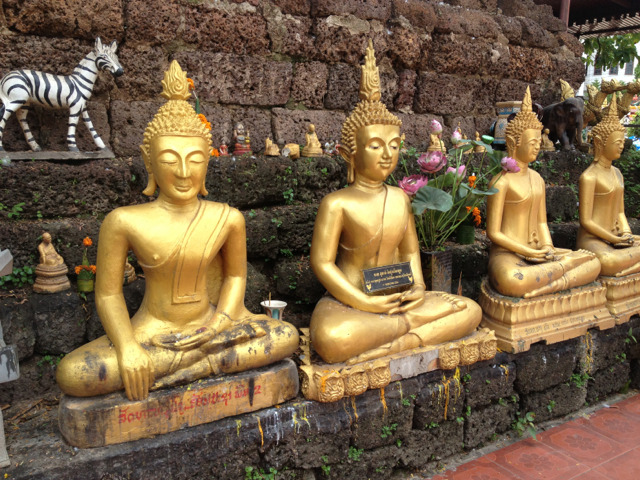 Laos is undeniably a Buddhist country, as evidenced by the abundance of golden Buddha statues, the monks draped in bright orange robes, and ornate red and gold temples on nearly every corner. 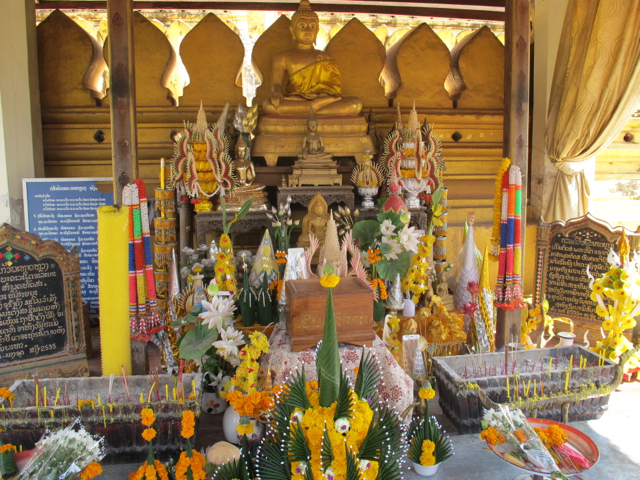 But before they were Buddhist, Lao people were, and still are, predominantly animist. As I’ve had it explained to me, animism is essentially the belief that everything has a spirit – from people, to animals, to rivers and mountains and trees. I think that’s a pretty admirable way to look at the world, especially if it makes you more in tune and appreciative of your surroundings. Of course, at its extreme, this philosophy can foster intense superstition, and I’ve heard that Lao people may be reluctant to walk around at night for fear of spirits or ghosts. This belief system is also at the root of the heartbreaking clash of cultures in the book The Spirit Catches You and You Fall Down. From reading that book, I thought animism was limited to the Hmong culture, but elements of it are quite widespread in mainstream Lao society. 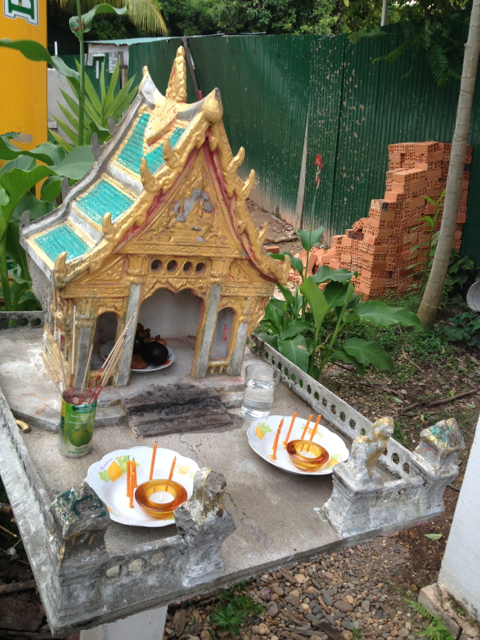 The most obvious evidence of this are the little houses seen outside almost every Lao business or residence. 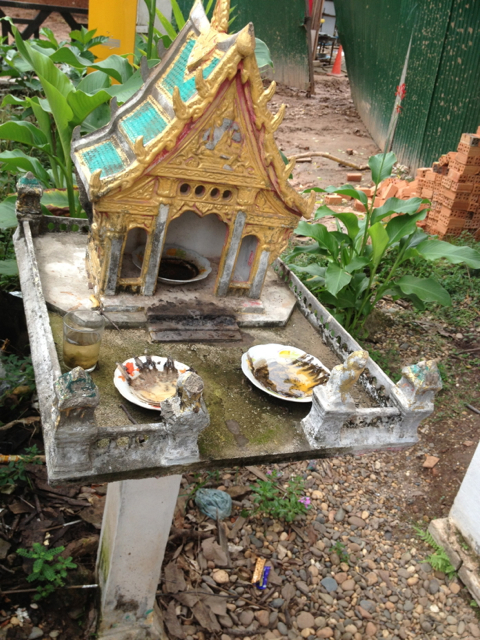 At first I thought these little altars were a Buddhist tradition. I wasn’t quite sure how to describe them – an altar? A shrine? The most fitting term I finally came across is “spirit house.” These structures are basically a place to make offerings to the spirit of your home or workplace – essentially, trying to appease it and keep it happy so it doesn’t wreak havoc on your life and fortunes. My office has a spirit house of its own, and when I finally noticed it, it was clear that it needed some TLC. One hot afternoon, I scrubbed down the moss and mildew – a bit of a delicate operation, since the flaking paint was readily coming off in the process. Once we got it tided up and picked up the garbage that had accumulated around it, Jacque and I made a few small offerings of candles, incense, and fruit to our spirit house. I’ve also seen flowers, drinks, and cigarettes as common offerings. It turns out we spruced up our spirit house just in time. 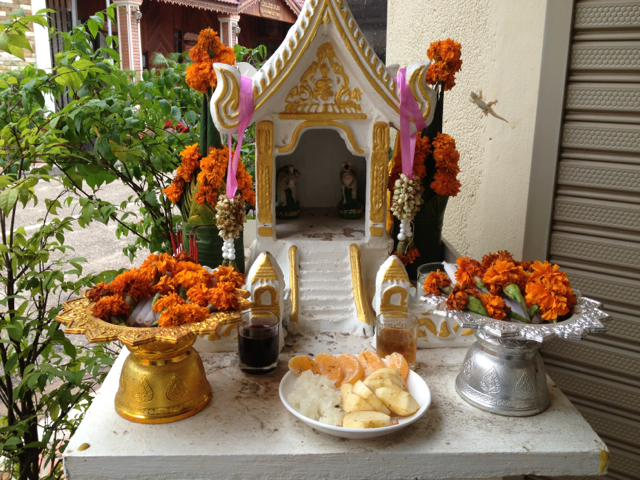 A few days later, September 4, turned out to be a festival called Boun Hor Khao Padubdin. It seems to be something like “day of the dead.” Sinsamout told us that people would go to the temples early in the morning and make offerings to appease the spirits of the dead who don’t have anyone to pray for them. 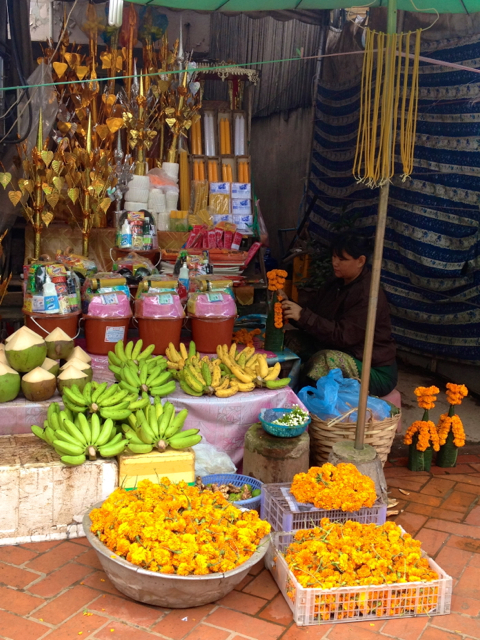 Vendors sell little offering “care packages” especially for the occasion, wrapped in banana leaves. 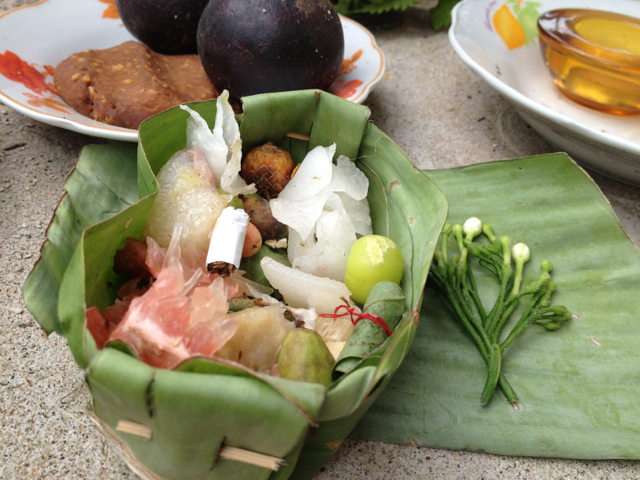 The banana leaf packets contain nine offerings, including several types of fruit and a cigarette… The local temples had strung up extra flags in preparation for the holiday. A cat enjoying the offerings. Jacuqe and I woke up around 5:30 am that day in hopes of seeing something interesting in the morning. But the dark streets were quiet. 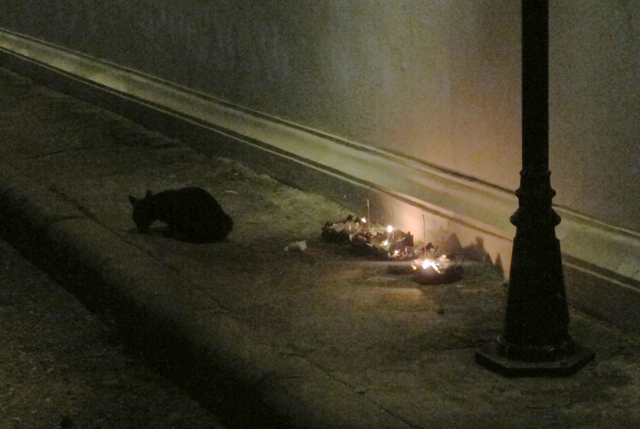 We came across a few candles burning on the ground alongside offerings at the side of one temple – and a cat who seemed quite content eating the offerings placed at his level. (A spirit incarnate, maybe?) 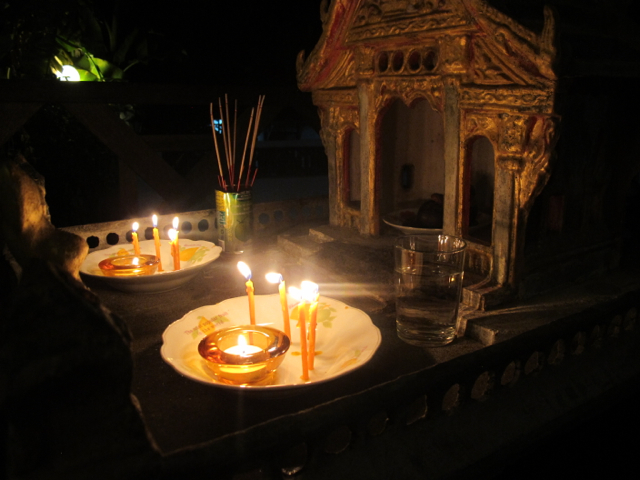 There were more offerings clustered outside the temple gates, little boats with candles flickering beside them. 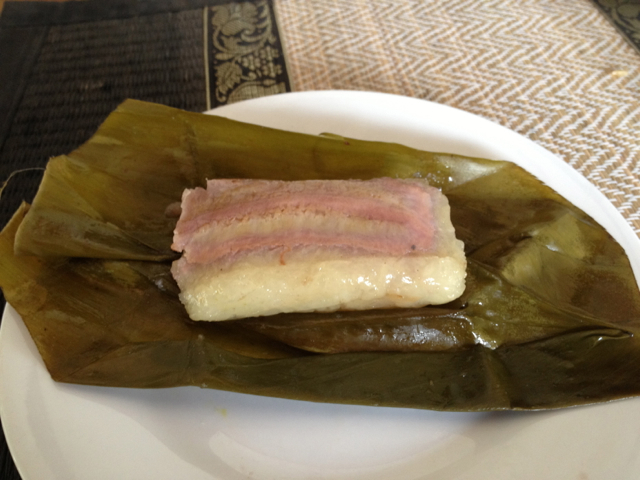 Later that day, Sinsamout brought flowers for our office spirit house and some delicious offerings his mom had made for the occasion – sweet sticky rice and bananas wrapped in banana leaves. Luckily, we got to sample them after they had been offered! 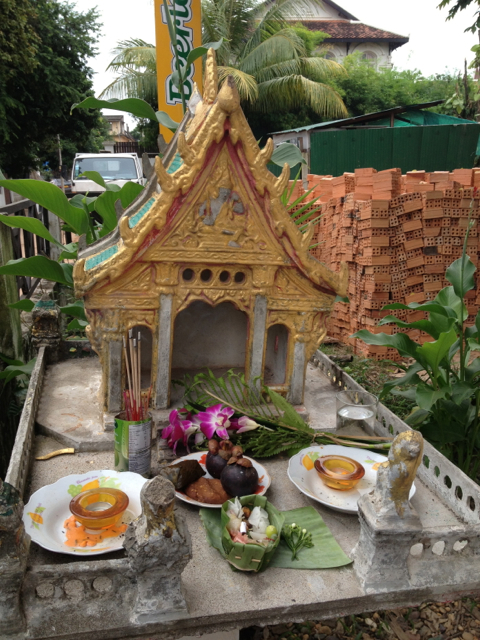 Offerings for our spirit house. 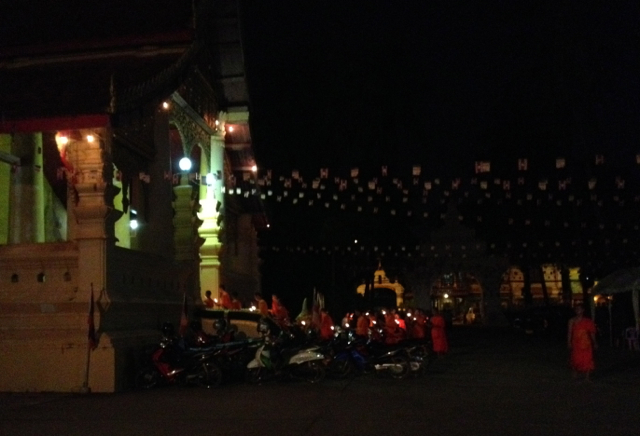 As evening rolled around, Jacque and I heard a steady drumming and chanting coming from one of the temples down the road. 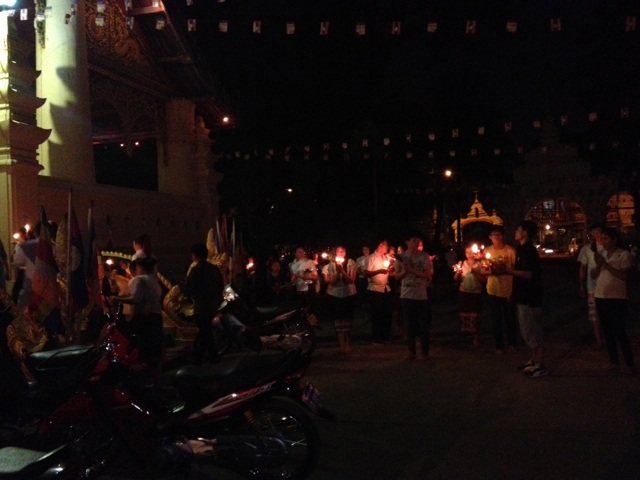 We wandered over just in time to witness a beautiful sight – monks finishing a candlelit procession around the temple, with dozens of community members following behind. Sinsamout later told us they walk around the temple three times. 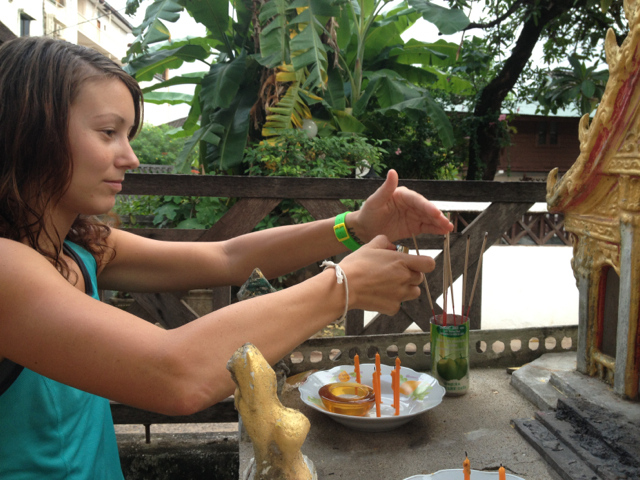 People then took their candles to various parts of the temple grounds, setting them and other offerings next to trees and stupas. 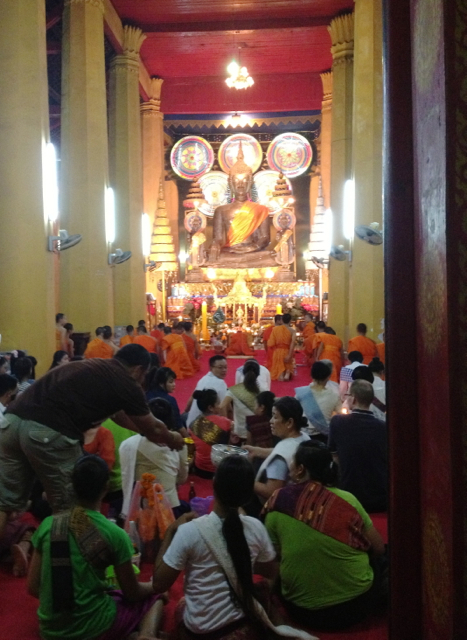 Everyone then crowded into the temple where the monks chanted and prayed. Since we walk past the temple pretty much every day, it was gratifying to see it as a hub of activity, and helped me feel like a part of the larger community in our little neighborhood. It felt quite special to observe this traditional practice full of flowers and candlelight, and be able to participate to some small degree. I will have to try to keep our spirit house looking presentable in hopes of good fortune for living and working here! Our spirit house by candlelight. 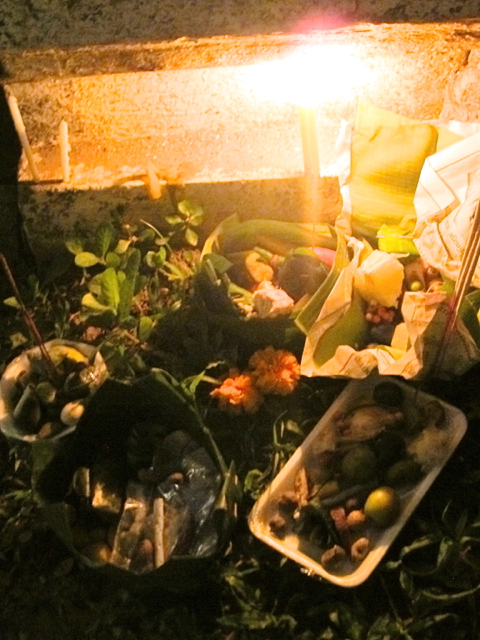 Offerings left outside the temple. The community gathers at our local temple. 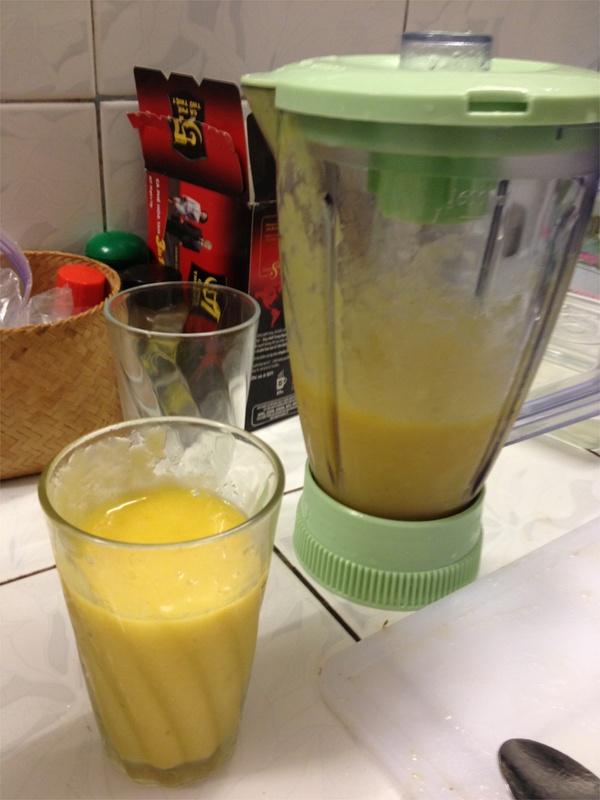 Back home, my mom is the smoothie queen. 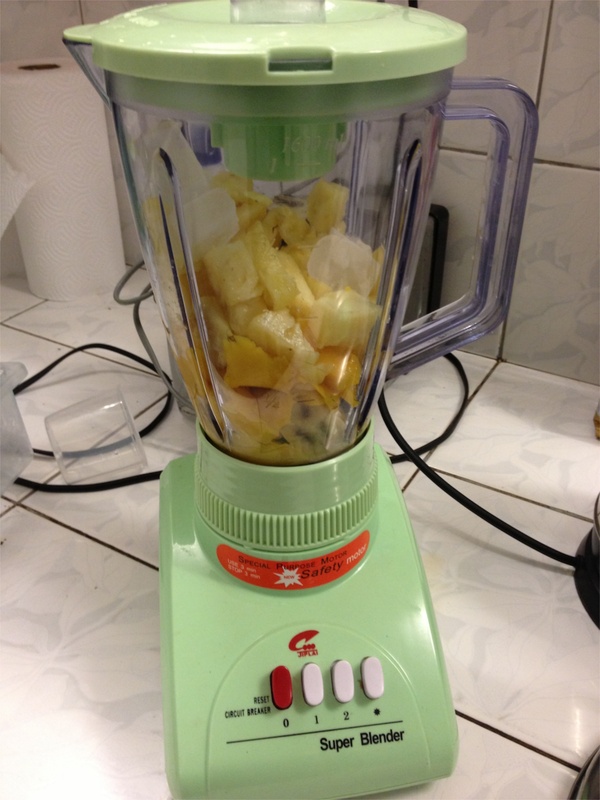 When I’m visiting, the sound of the blender whirring in the late afternoon tips me off that I’ll soon get to sample her latest creation. Smoothies are such a delicious way to beat the heat in Southeast Asia, and they’re obligingly on pretty much every menu. 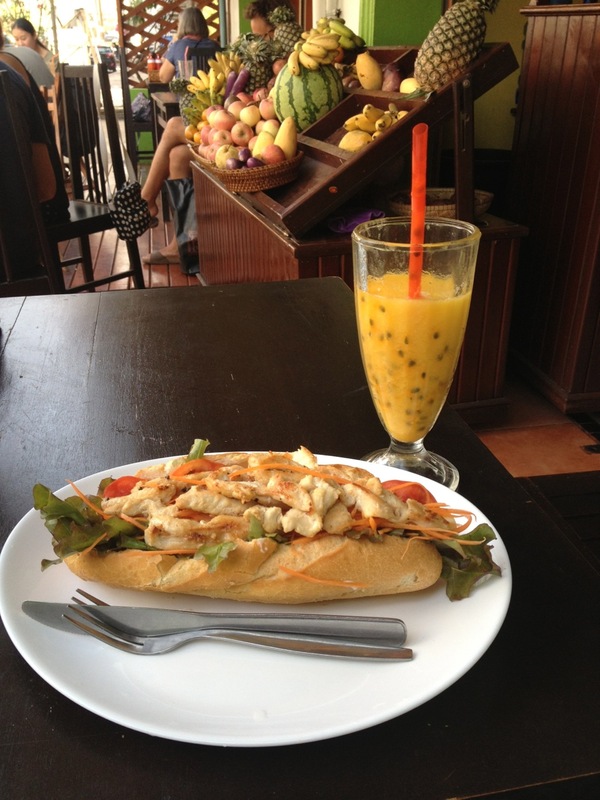 I’m guilty of ordering one with essentially every meal… In Can Tho, Vietnam, I had a favorite spot for mango smoothies. Here, my hands-down favorite is the mango-passion fruit combo – although many places serve it with the passion fruit seeds included, which I’m more ambivalent about. 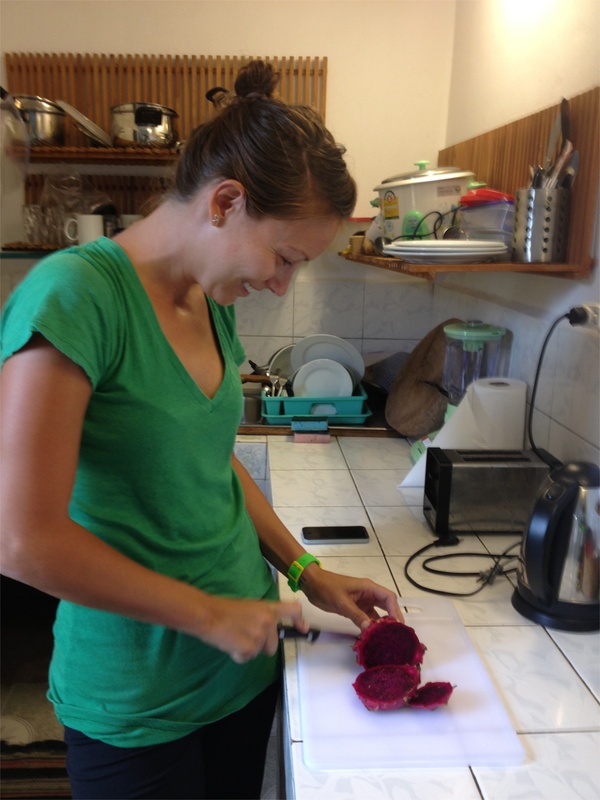 Jacque and I recently decided to test out the small blender in our kitchen to grind up the selection of tropical fruits we bought at the market. 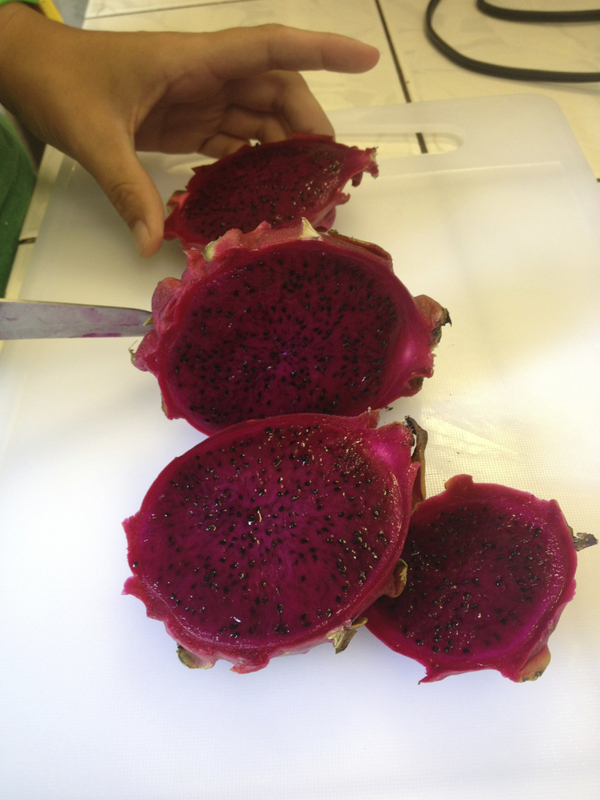 I was surprised when she sliced open a dragonfruit to reveal dripping flesh in garish pink — I’d only ever seen the Dalmatian-esque white- with-black-seeds variety. 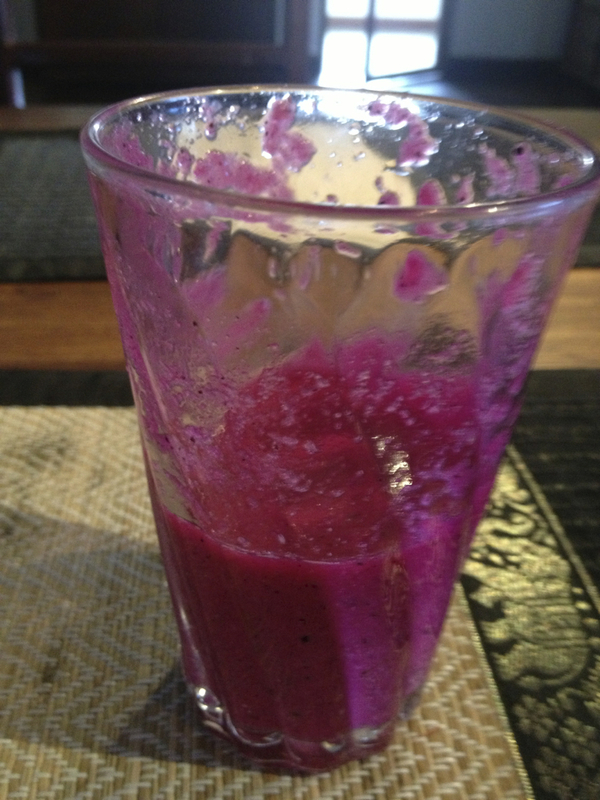 In any case, the smoothie was an instant winner in the color department! 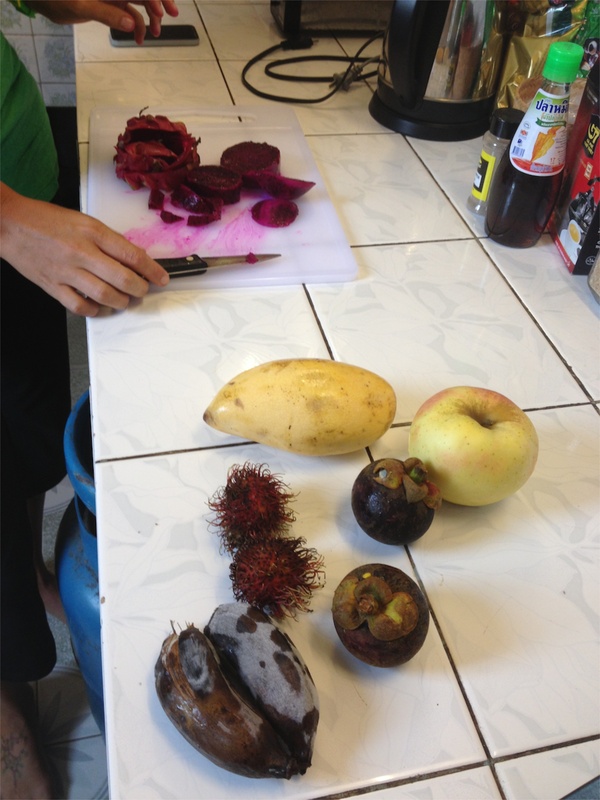 Taste wise, it wasn’t much — the rather bland apple I threw in overpowered the more subtle taste of the tropical fruits, like mangosteen and rambutan. 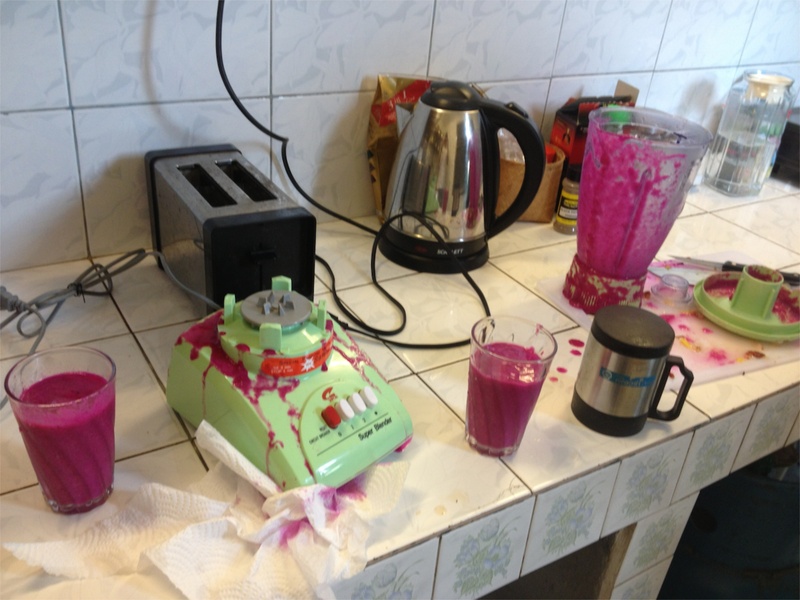 We didn’t quite have the blender screwed on all the way, so the end result was a fun color explosion, reminiscent of a high school chemistry lab. The second time around, I was going for the gold. 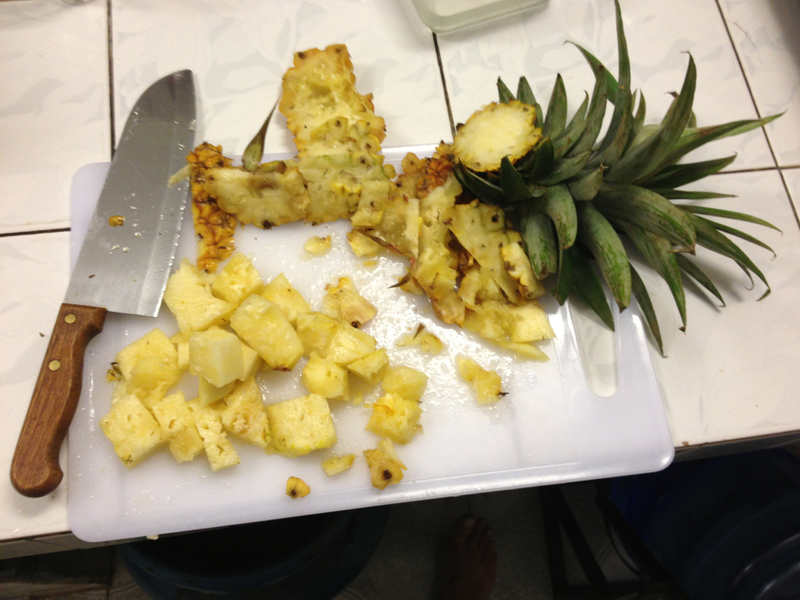 I had been on a mission to buy a pineapple at the market, and I got one so ripe that in a matter of days it was turning to juice, whether I liked it or not. 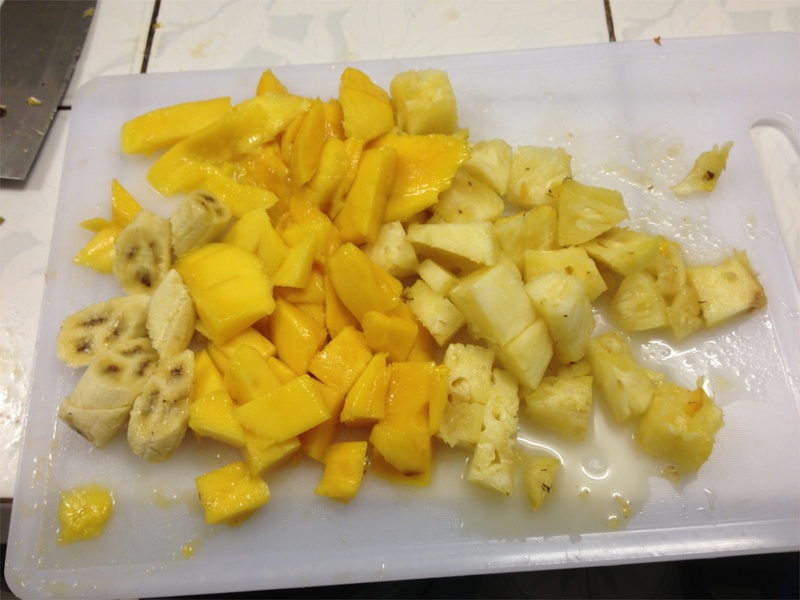 So into the blender it went, with some mango and banana for good measure. I’d say it was a winner! I suppose it’s time I wrote about something other than food. At the end of a long day, it’s hard to wrap my brain around anything too serious. Tonight is no exception – but I figured I could write about the other thing I love to take pictures of: flowers. 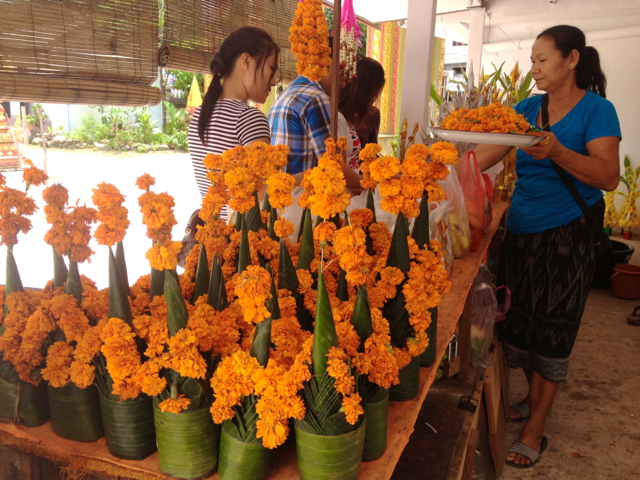 In Laos, it’s not flowers growing in gardens or yards that catch my eye, but the heaps and heaps of marigolds for sale for people to use as Buddhist offerings. Finally I can post some photos that do justice to how much beauty can be found here. 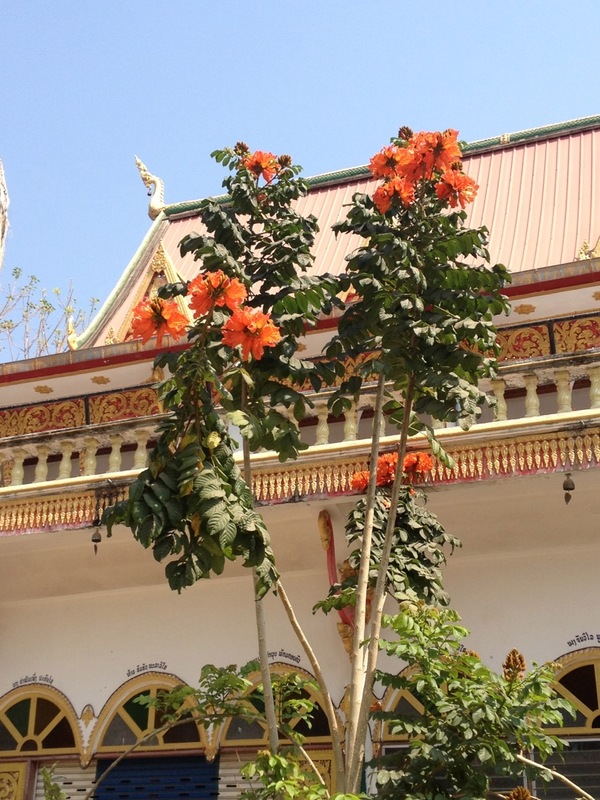 The sight just fills me with happiness on so many levels – especially seeing the flowers as offerings in the temples and on people’s personal altars and shrines. 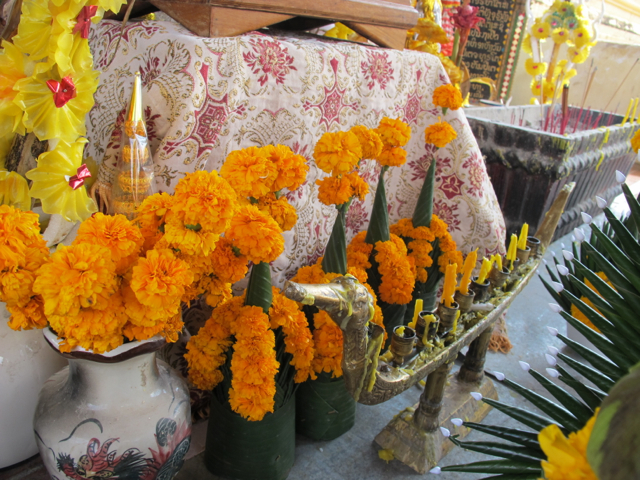 The color is one of my favorites and the idea of offering the flowers to the Buddha also makes me smile. I was just reading that, while marigolds are native to the Americas, they were introduced to South Asia in the 1500’s or so (at least according to these websites). I’ve definitely seen stunning photos of marigold-draped Buddhas in India. 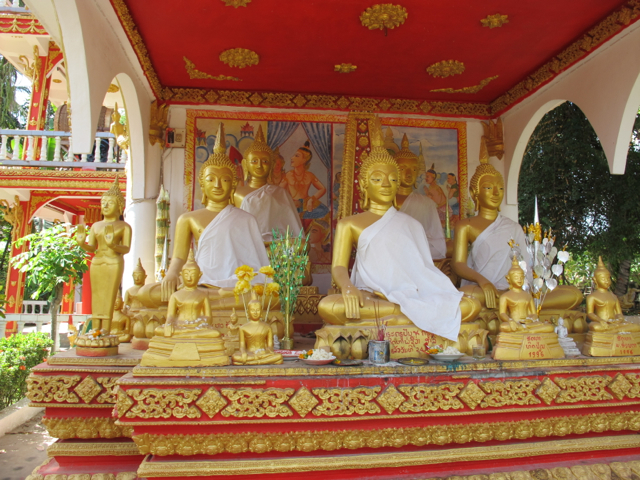 Gold is certainly everywhere when it comes to Buddhism here. Unlike the Tibetan, Chinese, or Vietnamese Buddhist images that I’m more familiar with, in Laos (and I’m guessing Thailand), the Buddhas and temples are all ornately carved, golden, and gleaming. The sight is like being filled with sunshine. 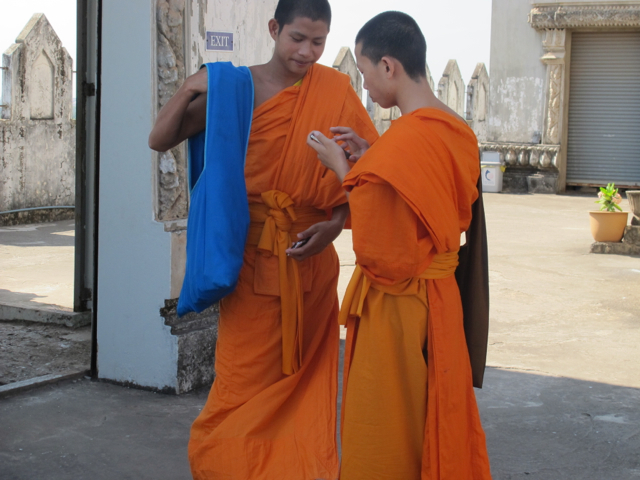 The bright orange that I love is also everywhere in the fabric of monk robes. With so many temples around, monks (or rather, young monks in training) are constantly passing by, often with an umbrella in hand to shade their shaved heads from the sun. Apparently it’s quite common for families to send their sons to become monks just for a few years – they aren’t necessarily becoming monks for life, just a temporary service. I’ve learned that monks aren’t allowed to drive scooters – although apparently it’s ok to ride on the back. Many ride bicycles instead. I love the fact that our office is right between two large temples. There seems to be a temple every few blocks, and you can usually walk right through them. They often have the best trees in the city. Sinsamout and I cut through two to go to lunch last week and avoided the traffic completely. You can even drive a scooter or car through some of the temples during the day time, although I find that a bit disconcerting. 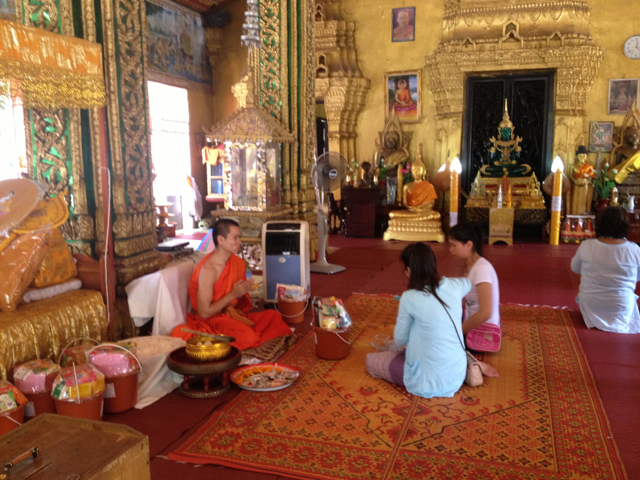 Jacque and I stopped into a larger temple while we were biking around a the other week – since it was a Sunday, many families had come to make offerings and receive blessings from the monks. 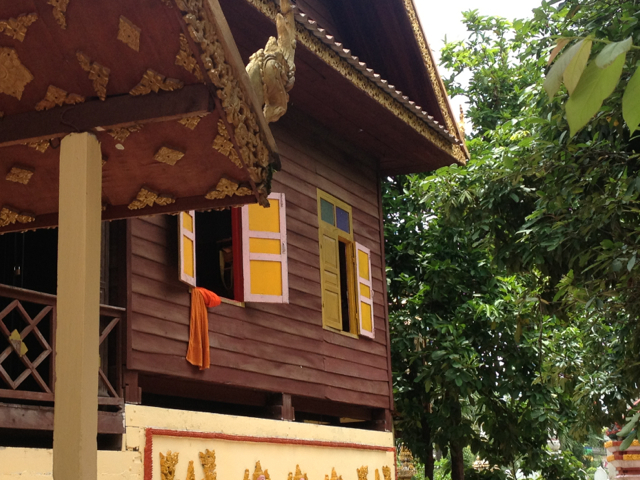 The monk “dormitory.” I love the color combinations. 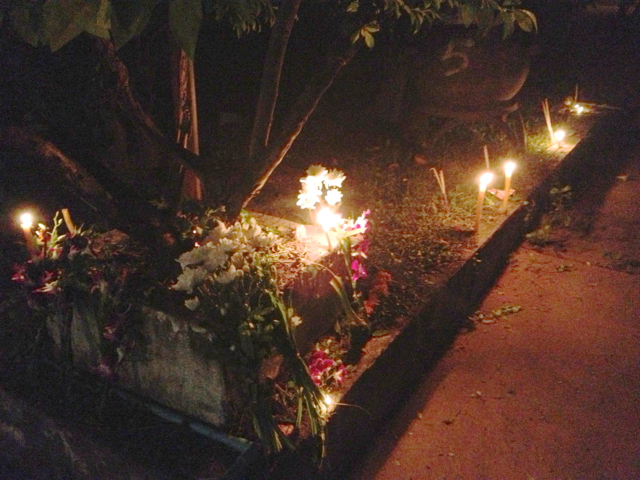 Around 5:45 pm every day, I hear the faint sound of the temple bell ringing next door, low and resonant, almost somber. It reminds me of my stay at a temple in Vietnam. Sinsamout said it’s calling the monks in to pray, and anyone can join to pray or meditate with them. Jacque and I peeked in last week on our way off to aerobics and saw the monks sitting there in rows before a giant statue of the Buddha lit up with spotlights. I will have to make a point to join them at least once before I leave. I could hardly find a better spot for a meditative reflection.